Surgical Loupes help to alleviate eye strain by enlarging the image when you are working on tiny subjects or conducting precision operations. They are portable and easier to use than a surgical microscope. However, they are not created equal, and choosing the pair that's right for you is important to your satisfaction. Choosing the correct surgical loupes for your application involves several factors, including resolution, working distance, field of view, depth of field, magnification, weight and interpupillary distance. 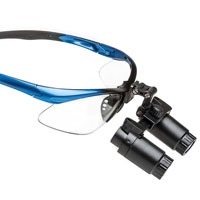 Let us help you choose the right pair of binocular loupes for you surgical application.